Rebuilding Together Orlando assists low-income senior citizens, veterans, families with children and disabled homeowners living in Central Florida with repairs to help make their home comfortable safe and dry. Ed Green, the executive director said, "Many today are faced with putting off critical home repairs in order to eat." The organization's goal is "A safe and healthy home for every person." I had met Ed once before at Urban ReThink. When I arrived at this home in a neighborhood off Kirkman Avenue, there were perhaps 15 people painting the building. Ed told me that the hone had been painted bright pumpkin orange but he convinced the owner to repaint the home a light beige so it would blend in better with the homes around it. A canopy was set up to offer volunteers shade when they took a break. 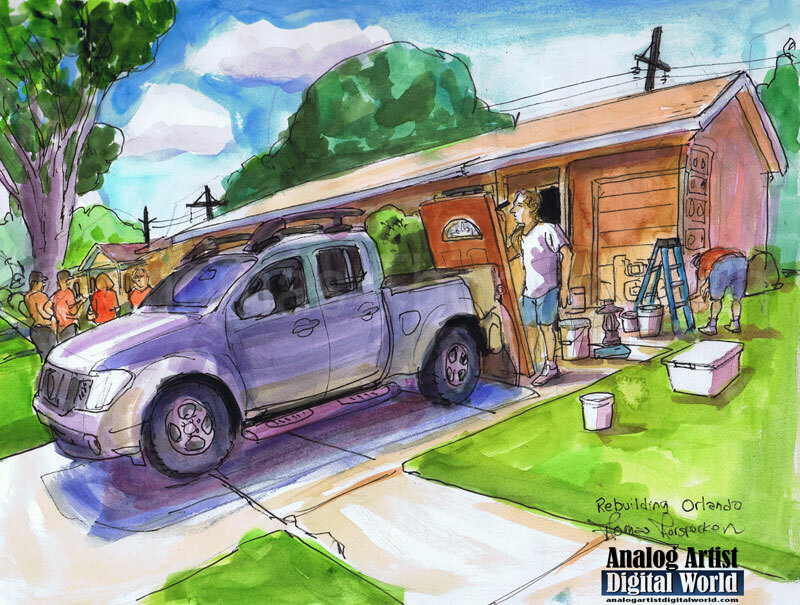 I sketched someone who was painting the front door which had been unhinged and leaned up against a Nissan pick up truck. Inside the house, a bathroom had been gutted and a new wheel chair accessible shower was being installed. A teenage boy in the home had Cerebral Palsy and the mother had to lift him to get him into the shower in the past. He wasn't a small child anymore so lifting him had become a challenge. The shower unit arrived while I was sketching, so work began in earnest in the bathroom. Most of the volunteers, in their red shirts, who had helped paint the home finished up and began to leave after socializing. A door to door insurance salesman stopped by and spoke to the home owners about his brand of insurance. The homeowner argued about how the offer didn't look so good. The salesmen then started asking about the work being done on the home. When he realized it was a volunteer project, he took interest saying he had done volunteer work in the past and he'd love to get involved. He signed up to do some volunteer work the next weekend.